Well, the big news is that TOMORROW is the opening of the First Ever Pretty Much World Famous Illustration Contest! I’m excited and also nervous! I’m really hoping we’ll get some entries. It would be so much fun to see the March Madness Contest winners’ stories brought to life in art! The contestants will get to have a bunch of people come around and see their art, including the pretty much world famous Iza Trapani and Lisa Thiesing who will be judging. They’ll get a chance to show their work to a boatload of authors who, in this day and age of self-publishing, might need an illustrator at some point – you never know! – as well as some teachers who might need a school visit from an illustrator at some point – you never know! AND they get a chance at some awesome prizes, most especially a portfolio critique by the pretty much world famous Michael Garland! And WE will get to see all their fabulous art! So much excitement is making me a little faint. Quick! 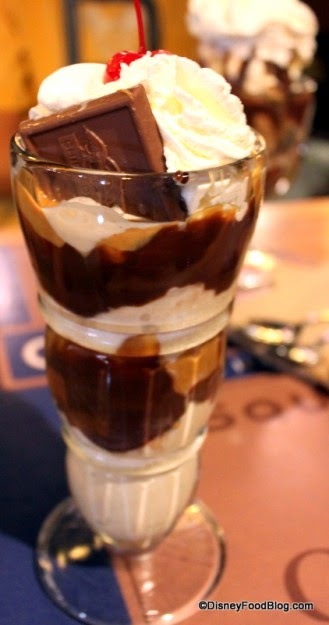 Something Chocolate! with homemade chocolate fudge and melted peanut butter! 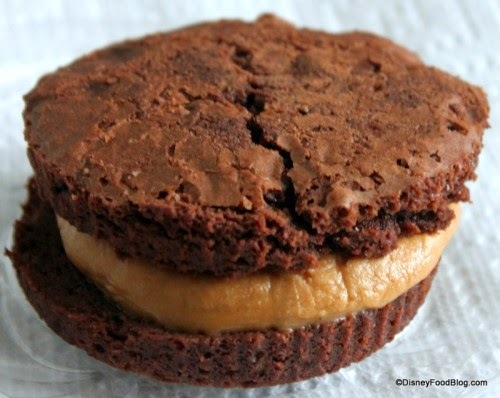 Peanut Butter Brownie Sandwich – Scrumptious!!! Now then. Ready for Would You Read It? Here’s the link to his Twitter page. He’s also on Facebook. Please send YOUR pitches for the coming weeks! For rules and where to submit, click on this link Would You Read It or on the Would You Read It tab in the bar above. There are openings in July so you’ve got a little time to polish up your pitches and send yours for your chance to be read by editor Erin Molta! And tune in tomorrow for the contest!!! Oh, and P.S. let me take this opportunity to remind the PPBF bloggers that there will not be a PPBF this Friday (April 25) or next Friday (May 2) because of the contest. The First Ever Pretty Much World Famous Illustration Contest for Children’s Illustrators!!! Now that I've finished drooling over our chocolatey peanut buttery eatery choices, I can say that yes, I would read today's pitch. As Nancy Tandon commented, I was intrigued by the wording but wondered if there was any conflict at all to solve. Maybe there's no conflict, but rather just entertainment? And oh my gosh…how is it contest time already?? I thought I had more time still. I've got a thumbnail done but not much else. Blah. Because I grew up watching and loving Fred Astaire and Gene Kelly, I loved Sean's idea. But as Nancy said, there needs to be something more to the pitch, something that tells a little bit of a story. If it's a book just about new dance steps without an actual story, that's fine too but he would need to convey that. Another yummy desert, Susanna! As for Sean's pitch, I'm intrigued, and I like the fun word choices. These alone would get me to look at the manuscript. I'd start off the first sentence with “Todd's moves” instead of “His moves.” And, as Teresa suggested, either hint at the story more or make it clear that it is about dances. Good luck! The pitch's “the first secret is…” bugged me a little. Sean certainly doen't need to give up the story's secrets, but the pitch does need to arrive at some kind of logical conclusion. And would I read it? Yes. I would very much want to dance The Lunch Lady at the next wedding I attend. I love the imagery in the opening, but I think the pitch can live without it. If this is a concept-type book with dance instructions, make than known and if it's an actual story, give us a hint about the conflict. I'd read it like crazy either way. It sounds hilarious! And I think the illustrations would be awesome. Good luck. I can't wait for the contest! I'm going to have to focus on eating chocolate bunnies so I don't explode with anticipation in the mean time. Thanks for the helpful feedback everyone! The big question I have…can I create a successful PB like this without the conflict/solution format? Is it too risky? My goal was to write a fun/silly “How-To” PB that doesn't follow the typical format. I didn't think about the conflict to the story because I was so busy wiping up my drool over the luscious desserts…after all, I just came in from the barn! After I went and cut myself a piece of Peanut Butter Pie and read the other comments, I do have to agree that there isn't a mention of conflict in the pitch…which would make it even more intriguing to me. I would, however, have read it anyway since I love stories that are just plain fun entertainment, too. Since I'm not an editor or agent, though, I think you might want to really consider all the more professional opinions that are in this comment. I love the pitch, but agree with not showing the opposite or conflic in the pitch and story — whether it be teasing from other kids to problems with being able to afford to buy his shoes. He has to grow in the story. Is it based one a famouse male dancer. I'm like you, I like positive stories that inspire, but agents don't. Hope everyone has fun with the illustration contest. Oh boy, illustrators, I can't wait to see your entries! Sean's book sounds energetic and cheerful and I'd love to learn some of Todd's moves, but I am not so sure a “how to” book for kids would be received by editors and agents. They do want a story. It can be a very simple plot, but something does have to happen to build a story then round it out in the end. On the other hand, I could be wrong and there could very well be publishing houses that might be interested in a how to dance book (Charlesbridge's Imagine imprint would be a good possibility.) In that case, you will definitely need to make the book informative- showing the steps, diagrams etc…I would rework the pitch so the reader knows this is a how to book in the non-fiction genre. Yes, I would read it–love all the silly dance names! But I agree with everyone who said you need a bit of a story to go along with the dances–it would keep the interest of little ones more, I think. Best of luck! I think the contest will be awesome! I can't wait to see the entries and watch the March Madness Winners' stories come to life! You made me hungry with those yummy photos! I want the Peanut Butter Brownie Sandwich. I think you've gotten some excellent feedback on your pitch, Sean. I think good points were made about a strong character and conflict. But, I would say if your dream is to write a fun/silly “How-To” PB that doesn't follow the typical format, give it a try. You will have to have something really unique with an unusual hook. It's always a good idea to write your story in several different ways so maybe try it as a How-To and as a strong character story and see which one you like the best. Maybe. I would like to know what is in stake for this character. This pitch tells us about the character, but not about the character's story. Thanks so much for chiming in for Sean, Becky! Thank you so much for your excellent thoughts for Sean, Erik! I'm definitely interested in knowing how to dance the fuzzy banana! Sounds fun. 🙂 Thanks for the special pb and chocolate treats Susanna!!! And while absolutely no vacuuming happened in my house today, I did make progress on my illustration! Chocolate has magical powers, but even it can only make cleaning so much better 🙂 Thanks so much for your very helpful comments for Sean, Stacy! And here's hoping we get lots of great entries for the illustration contest! Thanks so much for your thoughtful comments for Sean, Ann! Thanks for your comments for Sean, Pat! And only a few more hours until we (hopefully!) start to see some illustrations!!! That is an excellent thing to focus on, Lauri! One bite at a time. The illustrations will start rolling in before you know it 🙂 Fingers crossed we get at least one, hopefully a bunch!, for every title! Thanks so much for your helpful thoughts for Sean, Genevieve! I know! Doesn't that sound like fun??? Thanks so much for chiming in for Sean, Mike! Thanks so much for your helpful suggestions for Sean, Pam! The more chocolate the merrier, Teresa! 🙂 And no worries, you can still pull off an illustration. You have until Monday at 5 PM 🙂 Thanks so much for your comments for Sean! Thanks for your great advice for Sean, Nancy! Who left all those peanut butter brownie crumbs for me to clean up? Sorry I'm so late to the party! I like Sean's idea of fun dance moves being at the center of a story, but I, too, am wondering about a conflict or something to move it forward. Is Todd entering a dance contest? Is he an aspiring jr. choreographer? Is he the same age (6-8) as the potential readers? What about Todd will make them feel connected with him? I can think of several young dancers who would be intrigued with a story based on the basic premise that Sean has going here. I'd read the story, Sean…I love the idea of a kid who wants to dance! But I think you need to add some hint of the problem your mc faces. I scrolled down and you've got some great ideas here for your pitch. Wow…thanks everyone! SO helpful. Back to the drawing board. Glad it's been helpful, Sean! Glad you enjoyed the yumminess, Vivian 🙂 I aim to please 🙂 Thanks for your comments for Sean, and fingers crossed we'll get plenty of entries for the illustration contest! Thanks for your though-provking questions for Sean, Charlotte! I love the title (cuz I love to dance! ), but I would add 'dance' to the first words in the pitch, so we are not left guessing what kind of moves we're talking about here. Actually, I might even cut the poetic description (sorry!) to cut to the chase, but I still need at least one why – why is he ready, why is he revealing, why does he love to dance? In any case I do want to read it! Good luck, Sean. Thanks so much for your very helpful suggestions for Sean, Julie!